Come Bike With Syke and Cycle for SIBS! 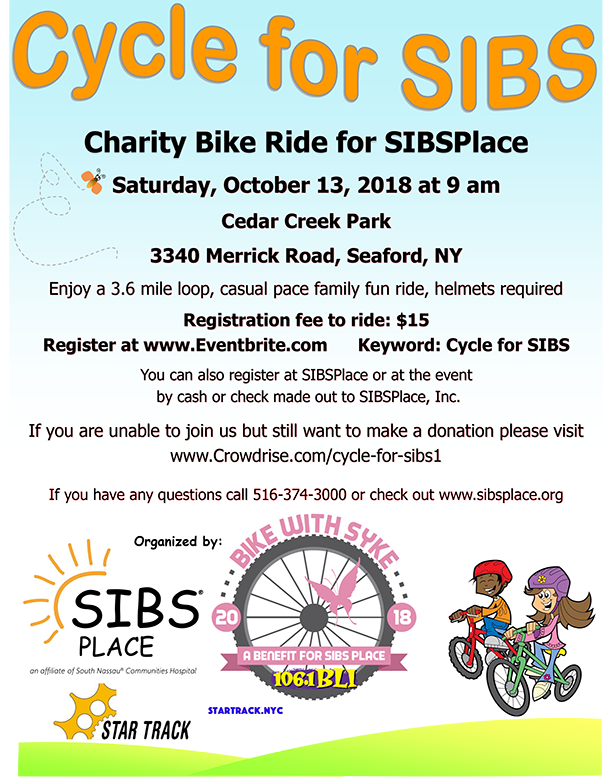 Bring the family and join BLI’s SYKE from Syke & MJ in the Morning for a charity bike ride for SIBSPlace Saturday, October 13th starting at 9am at Cedar Creek Park in Seaford! Enjoy a 3.6 mile loop, casual pace family fun ride with Syke all to help raise money for SIBSPlace, which provides free support for children with a traumatically ill sibling or parent. We’ll also have games and raffles on site! Just $15 per person to join the fun! **Remember helmets are required for the bike ride. SIBSPlace is a free therapeutic support program for children ages 5- 17 who have a sibling with a devastating medical illness or a parent with cancer. SIBSPlace provides expressive arts activities, helps to develop coping skills, provides dinner and homework support, bereavement counseling and so much more. Enjoy a morning of biking with your friends, families and SIBSPlace families while supporting a wonderful charity, SIBSPlace.